The easy way to upgrade your desktop or notebook to wireless connectivity. The AW-GU210 is a highly integrated wireless local area network (WLAN) solution to let user enjoy the digital content through the latest wireless technology. 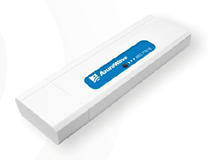 Compliant with IEEE 802.11b/g, the AW-GU210 delivers data rate up to 54Mbps, which enables you to share data, photos or any other information through the wireless network. Easy to use, on the go! Instead of stringing cables to the PC, all you need to do is just simply plug AW-GU210 into your notebook or desktop, and you can enjoy the wireless communication anywhere you like without using the extra cables and cords. The AW-GU210 supports Wi-Fi Protected Access (WPA) and 128-bit WEP encryption, so you can stream the data or audio more efficiently and securely!